Thinking of kitchen renovations? Forget the all-white kitchen. You can’t get better than the pleasing combination of mid-grey marble, white and wood. Easy to clean, and relaxing to live in, colours which copy the natural tones are becoming increasingly popular. How fantastic would your finished kitchen renovations look if you used this trending style? Think wood, although not the older style wooden cabinets popular in the 1970s. For your kitchen renovations choose walnut shades with a flat, not bevelled finish. If your budget allows – always go for Australian Messmate or Blackwood (both can be coloured darker stain). But if you are looking for a more cost effective solution choose Laminex in the walnut shades. Note there are microwave and wall oven insets. Tip – the colour of your larger kitchen cabinets will be what people notice the most, so make sure their tone is exactly what you want for your kitchen renovations. Go glossy and with no obvious handles. Glossy white cabinets do not only reflect light and keep your kitchen looking light and airy; they also are super easy to keep clean. Mid-grey marble look bench tops keep to the ‘natural’ theme of these kitchen renovations. Again, if real stone bench tops are within your budget, choose them. If not acrylic composite bench tops can look equally effective. Tip – some types of bench tops are made from more durable products than others – have a chat with one of our kitchen designers about which one will service your needs best. Draining overlay sinks are a fashion of the past. 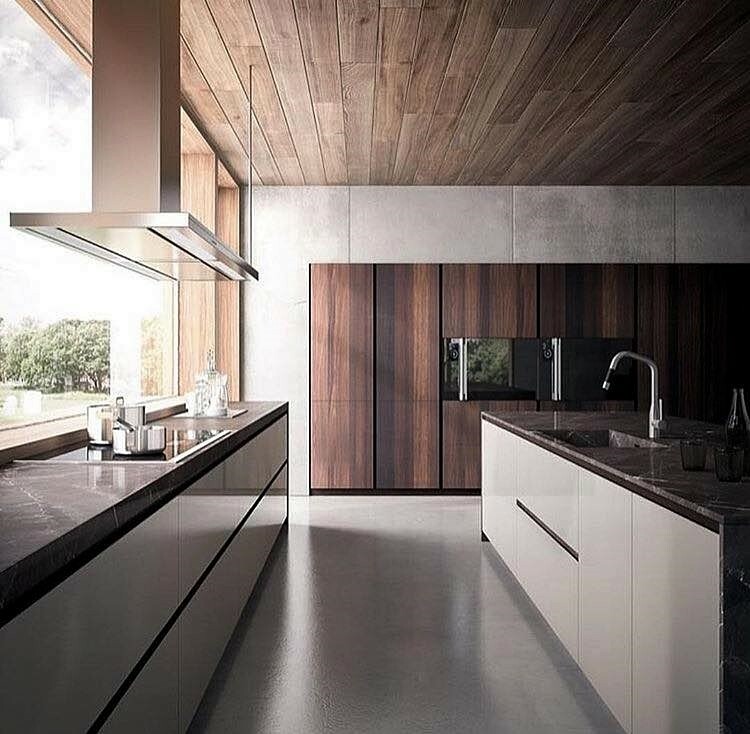 The one that is shown in this kitchen is made from the same materials of the bench top. However, an inserted undermount sink should look almost as effective. The big trending tapware are delicately angled mixer taps. No longer ‘just a tap’, these beautiful taps add an artistic element to the look of modern kitchen renovations. Tip- don’t buy cheaper taps they wear way too quickly – tapware is a kitchen essential which needs to be premium quality. Trending Kitchen renovations are now going for a no-tile/no splashback design. Large windows which run right down to bench stove tops are framed by wooden window sills. Having large windows is vital for lighting-up kitchen renovations which are using this style of décor. Tip – make sure you have an exhaust fan at least as large as the one in this picture. Not only does this range hood give an extra boost to the décor of this kitchen, you need to eliminate as many cooking vapours as possible. Without a tile or glass splashback behind the stove top, cooking vapours can be a nightmare to clean off a windo. Notice the tiles which match this décor perfectly are mid-grey and textured. Textured tiles give anyone walking through the kitchen a firm grip. And everyone needs to be able to concentrate on creative cooking, not worrying about slipping. However, also floor tiles which are too deeply textured can also hold dirt and grime. Lightly textured tiles are the best to combat cleaning problems. There is no doubt this type of kitchen renovation can look stunning, and it can easily be adapted to match any renovation’s budget.